The pre-insulated pipe market is enormous (world wide) and is the industry that feeds directly into the district heating and district cooling markets. These aren't particularly common in the United States; but there is still a large chunk of business there. This world is very, very different from the world of oil and gas pipelines. An example of some pre-insulated pipe. In this pre-insulated pipe world; shrink sleeves are used for two purposes: a) to protect the pipe (be that uncoated pipe or the bare steel of a girth weld) and b) protect the insulation from water ingress which can destroy the insulation and absolutely demolish the effectiveness of the pipe. To that end, I will focus on only two aspects here: waterstops and jacket continuation. Just as the name implies; waterstops are installed at the ends of the pipe in order to stop water from finding a path down the length of the pipe. Even though the insulation looks like it is tight to the pipe in the above photo; it isn't. There are leak paths all over the place. If water gets in there, it can very often begin to eat away at the insulation. If enough water gets in there, it could work its way down miles of pipeline, eating up the insulation just like pac-man eating up dots. Waterstops insure that even IF a single joint of pipe is damaged (say the PE jacket is punctured and water can get in), that water will not be able to affect more than one joint of pipe. Our product that is most often used as a waterstop is called an IPEC. It is a high expansion material made to bridge the sometimes large gap between the carrier pipe and the outermost PE jacket OD. Simple and fast to install, it is the perfect product to give any preinsulated pipeline extra security. 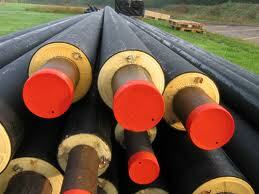 In the above photo, picture the field joint that is created when two of those pipe joints are welded together. There will be ~39 feet of insulation; then ~2 feet of bare steel; then another 39 feet of insulation. To tackle that in the field, they often use foam half shells to insulate the newly created field joint (there are other options as well different types of PU foams). Once they do whatever they are going to do there; they must find a way to 'continue' the outer PE which acts as the primary (actually the only) moisture barrier in this system. So what happens is that on the outside of the foam half shells; one of our shrink sleeves is installed that will span the entire field joint (sometimes two sleeves are used). This sleeve acts as a bridge spanning from the PE jacket of one pipe joint to the PE jacket of the other pipe joint; thus creating a continuous jacket against moisture ingress. Pretty simple really. What ultimately happens is that the configuration of the main line (insulation / PE jacket) is recreated at the field joint; making the pipe coating and insulation consistent through out. The product we sell most often for this application is our WPCT product (though we do sometimes use HTLP60 or WPC100M). There are other products that sometimes find a fit in the pre-insulated pipe market as well; including DHEC, Flexclad and others. That is one of the beautiful things about our product line, we have a tremendous amount of flexibility. In our warehouse, we've got all the tools we need to engineer a solution for you! What Happened to Raychem Corp? JSI Coatings. Travel theme. Powered by Blogger.